As lithium demand grows, innovation will be at the core of future supply. For investors, knowing what the key innovations will be and when they can be implemented is crucial for assessing the potential risks and rewards. At Acorn Capital, we follow innovations in the lithium sector very closely and use this knowledge to determine when and where to invest in this important and rapidly growing sector. Saline desert brines (known as salars) and hard-rock deposits containing the mineral spodumene are currently the two main sources of lithium. Over the next few years, these two deposit types are most likely to continue to provide the bulk of the lithium used in the electric-vehicle and battery-storage markets. In our view, investors seeking near-term results must understand what the key innovations are in the lithium-production space, which companies are making these changes and who will be best-positioned to take advantage of these changes in the future. However, for investors with a longer-term view it is also important to consider the potential impact of some of the unconventional lithium projects that are being touted. Outside of the standard brine and spodumene operations, there are several deposits with high concentrations of lithium that are currently sub-economic because processing technologies are insufficiently advanced to efficiently extract the metal. Should suitable technologies be developed, not only will it unlock great value for the pioneering companies, but widespread application of the processing method could have major flow-on effects for the junior explorers seeking mineral deposits to feed the lithium market. This article provides an overview of some of the key innovations that we think are likely to impact the near- and long-term supply of lithium. Brine operations are currently a major source of lithium, but the small number of salars on Earth, the diverse chemistry of the brine systems and the large capex to get them into production, mean innovations in this sector will have quite limited application. Despite this, recent advances in pond management, the design of purification circuits and understanding of brines characteristics are examples of where operational improvements are being made. In contrast, the numerous spodumene deposits that are under construction or in development (e.g., Pilbara Minerals’ and Altura Mining’s identically named Pilgangoora projects, Tawana Resources’ Bald Hill project and Mineral Resources’ Wodgina project) means innovations in traditional hard-rock sources are more likely to impact the near- to medium-term supply of lithium. Two recent examples of successful innovations in this area are the processing modifications made at Mineral Resources-operated Mt Marion operation and the Galaxy Resources-owned Mt Cattlin operation. In 2016 Mineral Resources engineered innovative design changes to the process flow at Mount Marion enabling the tailings stream to be further processed achieving a saleable 4% Li2O spodumene concentrate product. The Mount Marion improved design has had an immediate positive impact on production. The current annualised production rate is in excess of 474,000 tonnes of product per annum of coarse 6% and 4% products. Future installation of a flotation circuit will enable additional tonnes of fine 4% product. The production of a saleable 4% Li2O concentrate represents an important advance because it highlights the existence of a market for 4% Li2O spodumene concentrates. 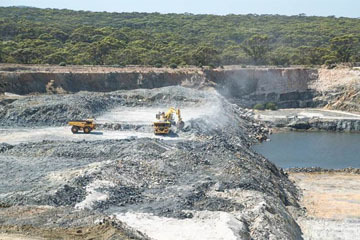 Mineral Resources can apply this knowledge in spodumene operations to deliver a low-risk near-term opportunity to increase supply at its Wodgina mine where it will shortly commence construction of a modular spodumene concentrate plant. Each module of the Wodgina plant will be capable of producing 250,000 tonnes of 6% product per annum and the company expects to bring two modules, representing 500,000 of additional spodumene concentrate supply, on line at Wodgina during Q3 of calendar year 2018. A third module, taking total spodumene production at Wodgina to 750,000 tonnes per annum, is planned for calendar year 2019. Innovative design changes were also applied to the Mt Cattlin processing plant prior to its re-start in 2016. These improvements focussed on reducing the mica content of the spodumene concentrate and increasing Li2O recoveries to about 55%. Recent operational data indicate that these improvements have been achieved, together with a doubling of the throughput. The focus at Mt Cattlin has now shifted to potential installation of an optical sorter and ultra-fines circuit that could further increase recoveries to 70-75%. A feasibility study is still to be completed on the second phase of changes so the viability of these modifications and their impact on near-term spodumene-concentrate supply will be known in the coming months. The recent lithium boom triggered a surge in explorers seeking large high-grade spodumene deposits. However, coincident with this activity several companies have been working on the development of processing methods that can extract lithium from minerals other than the highly prized spodumene. For instance, Global Geoscience is developing a method to extract lithium from a layer of near-surface clays in Nevada, Rio Tinto is working on a very large deposit in Serbia that contains a very rare mineral called jadarite, and Lepidico is refining its L-Max® process to process the once-overlooked lithium-bearing minerals lepidolite amblygonite and zinnwaldite. All three projects are at differing stages of development, and all three have the potential to impact lithium supply in very different ways. 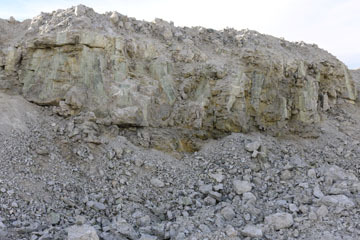 Global Geoscience’s Rhyolite Ridge project in southern Nevada is a large near-surface lithium-clay deposit that is amenable to open-cut mining. Preliminary metallurgical testwork has shown simple acid leaching can remove >95% of the lithium and boron from the clay unit that hosts the high-grade resource. While the two deposits identified by Global Geosciences in southern Nevada are large and the initial testwork results are positive, the project is at an early stage of development: a PFS and DFS will be completed over the next 2 years. Also, the clay deposits are interpreted to be the products of geothermal input into an ancient lake and thus are somewhat of a geological oddity. Therefore, the application of this technology is likely to be of direct benefit for Global Geoscience because future discoveries of this type will be rare. Similarly, Rio Tinto’s Jadar project in Serbia is another very large lithium and boron deposit hosted by a very rare mineral called jadarite (which has almost the same chemical composition of the fictional mineral kryptonite from Superman). While Rhyolite Ridge and Jadar projects have the potential to be major sources of lithium in several years, the unusualness of the deposits means the application of innovations associated with their development will be limited. In marked contrast to the technologies being developed for Rhyolite Ridge and Jadar, the L-Max® method being pioneered by Lepidico has potential for broad application. The L-Max® technology is being developed to commercially extract lithium and other valuable bi-products from unconventional sources. The lithium-bearing minerals lepidolite amblygonite and zinnwaldite are generally considered problematic by spodumene operations because of the challenges they create in the processing and refining circuits. If successful, Lepidico will produce lithium carbonate of suitable quality for use in the battery market. However, testwork and studies are still ongoing so it’s still too early to assess when and how lithium carbonate will be added to the market from this process. But if it is successful, there is potential for a second wave of exploration activity looking for deposits containing minerals that the L-Max® technology can successfully treat. The lithium boom has triggered a wave of innovations that will impact current and future supplies of the metal to the battery market. For the rapidly growing sector of spodumene operations, ongoing improvements in plant design are already producing higher recoveries and new low-grade products. As is the case for the application of any new technology, the progression in improvement will most likely be saw-tooth in nature rather than perfectly linear, but the overall trend is likely to be of improved yields with higher volumes of products at improved concentrate grades and qualities. For non-conventional lithium sources, there is potential for major new sources of lithium from one or more unusual deposits like the lithium clays in southern Nevada or the jadarite deposit in Serbia. However, the area for potential long-term growth is in the processing of unconventional lithium minerals such as lepidolite amblygonite and zinnwaldite. If successful, a second wave of exploration could be triggered as geologists begin searching for minerals that are currently considered low value.